The Orca Task Force overseen by Gov. Jay Inslee to come up with suggestions to improve conditions for the 75 Southern Resident orca whales in the waters of the Salish Sea, Puget Sound and the Strait of Juan de Fuca met Tuesday. Nearly 50 members of the task force focused on three main topics during their meeting: prey, toxic contaminants in the water and noise from vessel traffic. Specifically, new legislation to keep boat traffic and drones farther away from the orcas, according to a story by King-5 television. 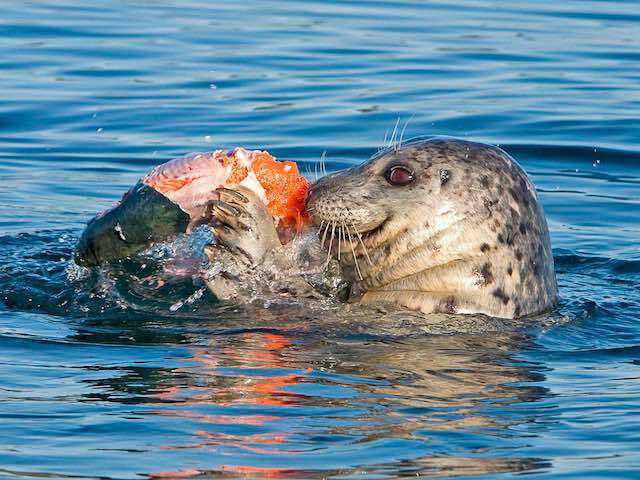 It sure seems like the task force is missing the elephant (seals) in the room: pinniped predation on the orca's preferred food source -- chinook. A letter by Sequim angler and tackle maker Darryl Sanford pointed to damage done by seals and sea lions, declines in hatchery production and what he believes is the largest obstacle to restoring fish runs, "the misguided notion that we have to keep genetics unique to each river." I'll tackle the seal and sea lion aspect of the situation below. There's not enough room in one column to wade into hatchery production and fish genetics. Southern Resident orcas hunting for chinook are at the end of a long line of marine mammals that get first crack at a meal, according to a November 2017 study in the journal Scientific Reports. "Why aren't the Southern Residents getting enough food?" asks Oregon State University scientist Brandon Chasco, lead author of the new study. He answers the question this way: "There are a lot of predators that eat before the Southern Residents do." Chinook have to leave their native stream or hatchery, swim through potential predators in Puget Sound and the Strait of Juan de Fuca to reach the Pacific Ocean and then do it all again on their return to spawn. An increasingly large army of pinnipeds is on their tails. And many of these chinook don't make it, some of the more than 8 million smolts a year that are estimated to be lost each year to predation by seals. "Harbor seals, protected by the Marine Mammal Protection Act of 1972, have nearly doubled in number in inland waterways and along the West Coast over the past 40 years -- going from 210,000 to 355,000," the November 2017 study found. "Adult California sea lions grew from 5,900 animals in 1975 to 47,000 in 2015. Steller sea lions increased as well, from 74,400 to 78,500." Orcas are still estimated to take the biggest share of chinook by weight, eating about 12,000 of the 16,200 tons of chinook consumed by all marine mammals, but those increased seal and sea lion populations certainly have a taste for chinook. Another study found seals and sea lions are eating about 1.4 million pounds of Puget Sound chinook each year -- about nine times more than they were eating in 1970, according to a January 2017 report in the Canadian Journal of Fisheries and Aquatic Sciences. This report was co-authored by Makah Marine Mammal Biologist Jonathan Scordino. The study estimates that seals and sea lions are decreasing potential returns by about 162,000 adult chinook each year. That's twice the number eaten by killer whales and roughly six times as many as caught in Puget Sound by tribal, commercial and recreational fishing interests combined. Changes were made to the Marine Mammal Protection Act in 1994 that allowed for "permanent removal" of sea lions known to be harming steelhead. Legislation in both houses of Congress, including a senate bill introduced by Sen. Maria Cantwell last week, aim to allow another modification to the act to let states and tribes cull more sea lions feasting on salmon in the Columbia River. It's not a huge number of sea lions, 100 per year, but if anybody remembers the sea lion Herschel and his voracious appetite for steelhead piling up at the Ballard Locks in the late 80s and early 90s, one animal can eat a vast amount of fish. Trimming the number of potential predators for chinook could be part of a solution. But the researchers in the studies mentioned above didn't offer an opinion either way. "What we don't know is, if the salmon had not been eaten by harbor seals whether they simply would have been consumed by another predator," Chasco said last month.